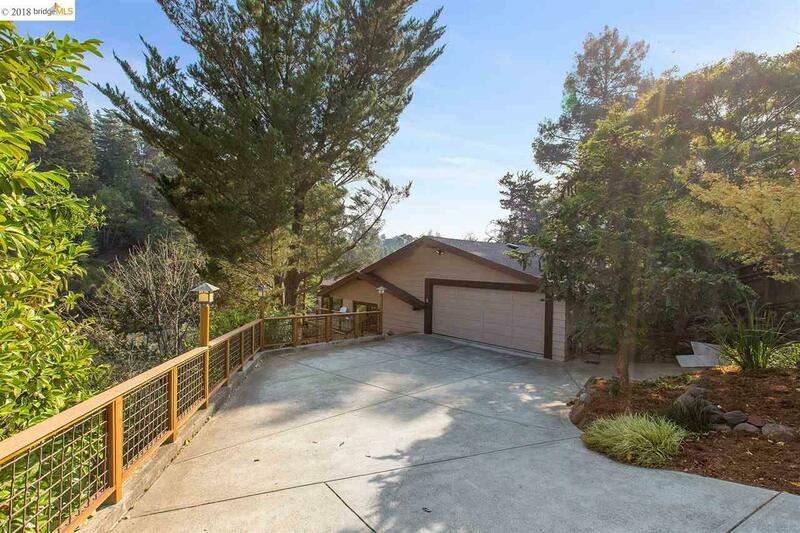 Meticulously updated 5BD++/4BA in the Montclair Hills. Spacious living areas w/picture windows & tree views. Australian Beech floors, designer lighting & custom finishes thru-out. Living/dining rms w/brick fireplace & easy outdoor access. Gourmet kitchen w/hand-oiled walnut cabinets, marble counters & SS appliances, including Thermador 6-burner stove & double dishwasher. Bathrooms on main level designed by Eco Home & have paper tile counters, custom vanities & locally made Heath tile. The Mid-level open floor plan boasts large family room, gas fireplace, full bath & 2 bedrooms, plus room for gym/yoga studio, laundry, wine cellar & multiple decks to yard & garden. Lower level could be 2nd master featuring 2 cedar-lined closets, sitting area/media room & full bath. Stunning backyard with edible garden - fruit trees & vegetables galore. Large slate patio, fire pit & Jacuzzi. Great location! Near Montclair Village, parks, & transportation.